If the pesto is very thick, you may need to add a bit of olive oil. Place the Brie on an ovenproof dish. Make about 8 wheel-spoke cuts down into the cheese, leaving a little circle in the center uncut to hold the wheel together during baking. With a spoon, carefully push a few tablespoons of pesto down into each slit so it’s flush with the top. Tie a piece of cooking string around the rim of the Brie to hold its shape. Preheat the oven to 350°F. Toast the pine nuts on a baking sheet for 5 minutes or until lightly browned; reserve for garnish. Place the cheese in the oven and bake for 10 to 15 minutes or until it just begins to melt. Remove from the oven, untie the string, sprinkle the pine nuts on top, and decorate with a garland of fresh basil leaves around the base of the cheese. Serve immediately with crisp crackers. Can be prepared up to 2 days ahead through step 2, covered, and refrigerated. Keep the pine nuts covered at room temperature. Bring the cheese to room temperature before baking. For both recipes, combine all of the ingredients in small glass bowl and mix to combine. Cover and let rest for at least 4 hours so that the flavors have time to meld. Serve with a spoon or pour into small plates for serving with bread. Lightly spray a large roasting pan and combine the leeks, garlic, 1 tablespoon of vinegar, olive oil, salt and pepper. Add the eggplant to the roasting pan and toss with tongs to coat. Place the eggplant mixture in the oven and roast for about 1 to 1¼ hours or until very soft, tossing the eggplant with a large spoon every 15 minutes so it will cook evenly. Meanwhile prepare the relish: combine the tomatoes, oil, vinegar and salt and pepper and mix to combine. Taste for seasoning and reserve. Remove the eggplant mixture from the oven and cool. Add the remaining 1 tablespoon of vinegar, basil, thyme and capers and mix well. Taste for seasoning. To make the pitas toasts, preheat a broiler. Split each pita in half, and then cut each half into 8 triangles. Brush the top of each triangle with oil and then sprinkle with Parmesan cheese. Working in batches, spread the triangles on a baking sheet and toast in the broiler until brown and bubbly, about 3 minutes. Let cool. Repeat with the remaining pita triangles. Mound the eggplant dip into a serving dish. 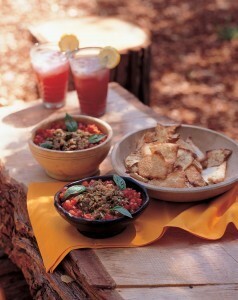 Garnish with the tomatoes and whole basil leaves. Cover and refrigerate until serving. Serve with Crispy Pita Toasts. Make sure to select firm, unblemished heavy eggplants for best flavor. Pitted Greek olives could also be added to the dip if you like. This is also good as a spread on lavash topped with peeled roasted peppers and basil leaves. To accompany the dip I like to serve glasses of chilled Prosecco topped off with a touch of peach nectar and a thinly sliced peach. Puree the scallions and eggs together in a food processor fitted with the metal blade until they are smooth and fluffy. Add the potatoes and pulse until the mixture is finely chopped but still retains some texture. Add the salt, pepper and matzo meal and quickly process to combine. Do not over process. Pour the batter into a medium mixing bowl. Let the batter sit for 15 minutes, covered with plastic wrap to prevent discoloration. Heat ¾ inch of oil in a large non-stick skillet on medium high heat. Pour a tablespoon of batter into the skillet to test the oil. If it is hot enough, the pancake will begin to sizzle and brown. Taste the pancake and check the seasoning. Spoon tablespoons of the batter in the skillet, making sure that there’s a little room between each pancake. Flatten them with the back of a spoon and use the spatula to round out the sides, if necessary. Fry the pancakes until they are golden brown on one side, about 2-3 minutes, then turn them and brown the other side, about 2 more minutes. They should be golden brown. Transfer the pancakes to a cookie sheet lined with 2 layers of paper towels. Allow the excess oil to drain. 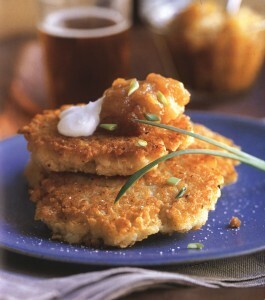 If serving immediately, place the pancakes on a platter and serve with the applesauce and sour cream. You can keep them warm in a 275F oven if necessary. Make sure to remove the paper towels before putting them in the oven.